Once Maintenance is completed and the necessary Elastic Beanstalk configuration changes are made, a blue-green deployment is forced where a graceful replacement of existing instances with new, updated instances (that contain the new configuration change) takes place. The tutorial covers In-ASG and Independent Beanstalk integration methods in separate steps. Elastigroup is synced with Beanstalk environment. Note: While in Maintenance Mode, the service remains available and your instances are still running. Open the Elastigroup Management View. Under Configuration Update click Start Maintenance. 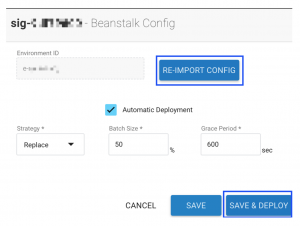 Perform the changes to the Beanstalk environment in the AWS Console. After making the changes, select Roll Updates to initiate a blue/green deployment that gracefully replaces the Elastigroup’s instances with new instances containing the configuration changes. To learn more about deployments/rolling in Elastigroup click here. 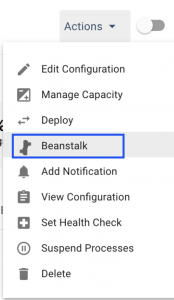 In the Elastigroup Management View, under Actions select Beanstalk. In the pop-up window, click Re-Import Config to import the updated configuration. Configure the blue/green deployment to be initiated. The blue/green deployment gracefully replaces all the instances in the Elastigroup with new instances containing the configuration changes. 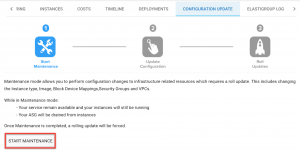 For more on deployments/rolls in Elastigroup click here.